Villa Dracoena is an authentic 'Belle Epoque' Villa. It is located on Mont Boron, the heart of French Riviera on the cape of Nice, between the 'Baie des Anges' and 'Villefranche', overlooking the sea and the 'Baie des Anges'. Its garden is 1000 meters square and contains many trees, notably orange trees, and exotic plants. The villa is close to the natural forest of 'Mont Boron' where it is very nice to walk between wood and sea. The Villa is located at a walking distance to the old town of Nice and the ' Promenade des Anglais', 5 min from Villefranche, 15 min from Nice International Airport and 20 min from Monaco. Heating for pool is available. Ski areas: Isola 2000, Auron, Valberg. Villa Dracoena welcomes you between "Villefranche and Baie des Anges", in one of the most beautiful area of the French Riviera. Facing the Mediterranean, in the greenery of a beautiful garden and its heated swimming pool, comfort and authenticity are united for your pleasure. toilet, combination tub/shower, separated toilets. Ensuite bathroom. 9000 meters square designed garden. Many mediterranean plants and trees. 5 terraces. 3 with great sea view. a 75 meters square roof terrace with a 180° sea view. We stayed at the villa in May 2017. The villa is beautiful with views of the sea. The location is perfect, as it is in a quiet section of Nice. The villa is clean with a large kitchen and comfortable bedrooms. The pool and gardens are peaceful. A private garage was available, which was a plus as we rented a car. We were able to walk down to the Promenade (40 minutes) and enjoyed the awesome view while exercising. We also used Ubers to get into town quickly to shop in the open air markets, dinners, etc. Day trips to Monaco and Eze Village were easy. My husband, an avid cyclist, arranged rides up into the hills with Azur Cycling Tours. The scenery was stunning. Would definitely recommend this villa! Thank you Diane for your review witch will be very helpful for future guests. We hope to welcoming you again. Wonderful property for our family of eight (3 generations). Luxury villa with spectacular views, lovely grounds, heated pool. Quite secure in quiet upscale neighborhood. Very accommodating owner. Just a note- seniors, like me (72), should be aware that this is a hilly area so long walks were not for my wife and I, though all the others did well. I must give a big shout out to the wonderful Uber drivers in this area. They were prompt, their vehicles spotless and top of the line (we used Uber Van) and they will go far afield. This was the best Uber service we have experienced anywhere. All this made for a truly great holiday! Thank you Michael. We look forward to welcoming you again. Many thanks to Patrick and his family. We look forward to welcoming you again. Pascal. The Villa Dracoena from the beautiful era (Belle Epoque) is perfectly located in a very residential area, overlooking the mediterranean sea between Villefranche-sur-Mer and The Baie des Anges in Nice. It is closed to the historical center of Nice and the renowned "Promenade des Anglais". The villa features 4 bedrooms with AC, 4 bathrooms recently renovated in marble, superbe indivudual terrasses with magnificient sea views. One of the terrasses located on the top roof is easily accessible by a beautiful staircase. 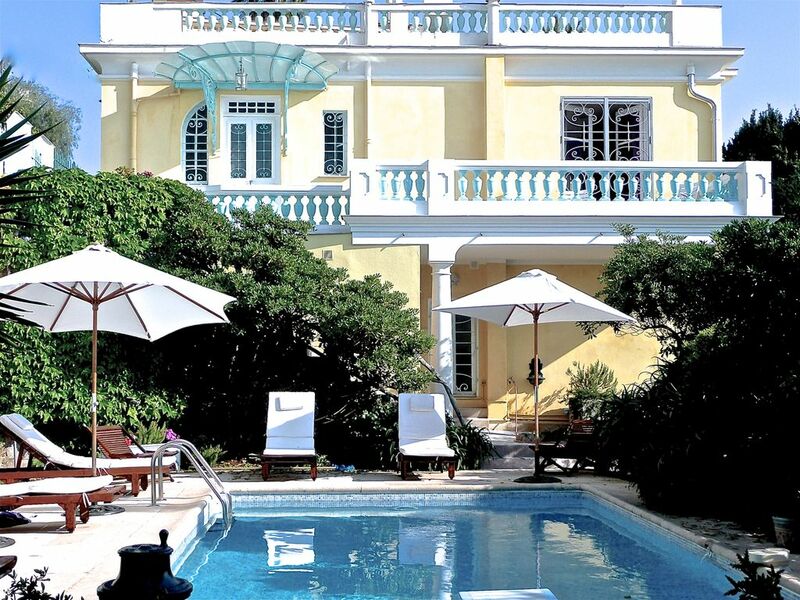 The property also features a heated pool surrounded by beautiful mediterranean plants and an orange tree garden. Everything make your stay very enjoyable. The historical center of Nice is easily accessible by foot or by bus (bus stop 2 blocks away). There is no need for a car. There is also a supermarket Carrefour nearby: very useful for everyday's shopping needs. As many other people, I highly recommend this villa ! La Villa Dracoena si trova a Nizza sul Mont Boron, la zona più residenziale della città. Siamo stati accolti da una coppia molto gentile che ha risposto a tutte le nostre domande e che ha tenuto pulita la casa durante il nostro soggiorno. La villa è molto elegante, arredata con gusto e tanto accogliente che ci si sente come a casa....ed è PULITISSIMA! Abbiamo potuto prendere la nostra colazione la mattina e il café il pomeriggio sulle due terrazze della casa che hanno una vista stupenda sul mare e da dove si vede tutta la baia di Nizza!! Avevamo una macchina molto grande ed era comodo poter parcheggiare a 100 metri dalla porta di casa nel posto riservato per la villa. Comunque anche senza macchina, ci sono autobus per il centro della città e per Monaco a 5 mn a piedi dalla casa. I nostri giovani hanno provato e hanno detto che era molto commodo! Comodissimo anche il supermercato a 5 mn a piedi !! La citta di Nizza ci è piaciuta molto, è stata tutta ristrutturata benissimo e ci si mangia anche bene! anche cucina italiana....... Abbiamo fatto delle belle passeggiate per andare a vedere" Ville franche" e" St Jean Cap Ferrat " due posti stupendi!! Sono stata veramente benissimo in questa casa e non vedo l'ora di tornare d'estate per godere della piscina riparata dalla gente, e dove c'è il sole tutto il giorno. This beautiful villa is a wonderful location for a family vacation. The views are spectacular, the home is charming and very comfortable. The house is well-situated near three bus lines with easy access to old Nice as well as surrounding hill towns. The on-site manager, Christian, is very helpful and easy to deal with. A lovely, enormous park on Mont-Baron is easy walking distance from the house. I recommend you hike up to the 16th century fort in the park, it's a fascinating excursion. The villa Dracoena is located 15 minutes from Nice airport and 20 minutes from Monaco. Nice center, Villefranche, Monaco can be reached by bus (10 minutes to reach Nice center by bus). The bus stop is close to the Villa (100 meters). A large Carrefour store is available 100 meters from the Villa. Several very nice restaurants are located less than 15 minutes walking from the Villa Dracoena. Other Activities: Ski in winter within 60 minutes drive.